Virginia Gov. Terry McAuliffe joined WTOP on May 31, 2017 for "Ask the Governor." WASHINGTON — Virginia Gov. Terry McAuliffe said he is willing to intervene in other cases of undocumented immigrants facing deportation for minor offenses and that he would evaluate those cases individually. 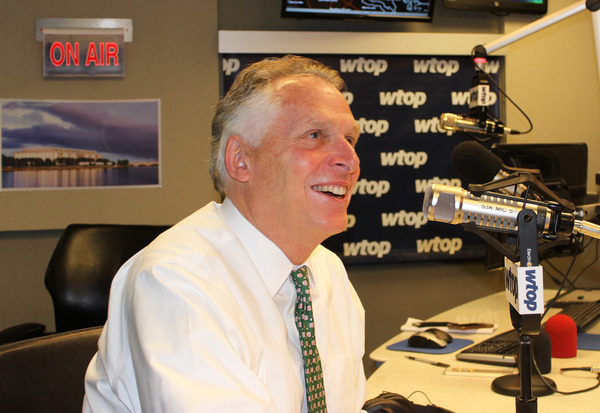 "I'll do anything I can to help Virginia families," McAuliffe said during an appearance Wednesday on WTOP's "Ask the Governor" program. McAuliffe said he pardoned a Falls Church mother, who was stopped for a broken taillight and was found driving without a license in 2013, because he hoped it might help her efforts to remain in the country. But he said he also wanted to send a message: "We are not going to tolerate this. We are not going to tolerate people being harassed. I do not want to see this woman ripped apart from her family, her husband and her two children because she was driving without a license." Liliana Cruz Mendez, 30, originally from El Salvador, learned last week that Immigration and Customs Enforcement planned to proceed with her deportation. The federal agency twice exercised "prosecutorial discretion" and delayed deportation in 2014 and again in 2015. McAuliffe said after the program that he's instructed his staff to review all other such cases involving pending deportation proceedings for what he called minor offenses, like Cruz Mendez's. His office has learned of at least one other individual facing similar circumstances. "I'm going to lean in to protect Virginia folks who have not committed serious offenses. I am going to lean in for you," he said. The governor said that he would not extend such help to those who commit serious or violent crimes. But he would review each on a case-by-case basis. McAuliffe, a Democrat, has been a vocal critique of the Trump administration's immigration policies, including the contested travel ban on seven Muslim countries. McAuliffe wants the flexibility to decide how Virginia will pay for its share of Metro's funding. "Come up with a good formula. Go to us and say 'here's how much you need.' And let us in our respective jurisdictions — Maryland, D.C., and Virginia — and let us figure it out." McAuliffe said that under a regional sales tax plan floated this spring, a majority of the revenue collected would come from Virginia, even though roughly a third of Metro's ridership comes from the state. But McAuliffe said he is optimistic that an agreement to fund Metro can be reached. He expects to receive a preliminary report from Ray LaHood, the former U.S. transportation secretary, laying out a plan for lawmakers by September. The full report is expected in November. LaHood has been working to find consensus among leaders in D.C., Maryland and Virginia as well as Metro, McAuliffe said. "He's coming up with a plan that he thinks we'll all agree to," McAuliffe said. Sen. Frank Wagner, one of three candidates seeking the GOP nomination for governor, held a hearing in Richmond on Wednesday on air quality regulations McAuliffe has directed his administration to write. The draft regulations, which are intended to reduce carbon emissions from power plants, aren't expected to be completed until the end of the year. No one from the governor's administration planned to attend Wagner's hearing however. McAuliffe said the director of environmental quality was out of the state on vacation and that his administration provided other dates when officials would be available to attend. McAuliffe said that Wagner was "grandstanding." "The reason I did this executive directive was to get rid of hot air. Frank Wagner is adding hot air." McAuliffe wants the state to take steps to reduce carbon dioxide emissions and to support green-energy businesses in the state in an effort to reduce flooding risks from sea-level rise. The governor, who is barred by term limits from running for re-election, is backing Lt. Gov. Ralph Northam in the Democratic primary. He said he would support Tom Perriello however should the former congressman from Charlottesville prevail. The winning Democrat will face one of the Republican nominees in November. Ed Gillespie, the former Republican National Committee chair, and Corey Stewart, chair of the Prince William County Board of Supervisors, are also seeking the GOP nomination for governor. Dominion Resources' plans for the building of the Atlantic Coast Pipeline through Virginia include blasting, excavation and partial mountaintop removal along 38 miles of Virginia Blue Ridge. This is unacceptable to most Virginians. What are your plans to stop Dominion from doing this? It was reported that Virginia booted 5,556 self-reported non-citizens off the voter rolls who had cast 7,474 since 2011 (http://dailycaller.com/2017/05/30/virginia-booted-5556-non-citizens-from-voter-rolls-report-says/). What are you going to do to ensure we have fair elections and that non-citizens are removed from voter rolls? Why is gasoline taxed on price rather than quantity/volume? It seems there would be less fluctuation if it were bases on quantity/volume. When will cannabis be legal in Virginia? The tax money could pay for schools, roads and metro. The governor is not concerned that there are non-citizens voting in Virginia because of our strong voter ID laws. However, Virginia drivers licences are not adequate for TSA and have an extended deadline to comply. I think that fact may negate the governors contention that the state voter ID laws are adequate. Please talk about what can be done at the state level to address high teen suicide rates in VA - particularly in Loudoun County (known by many educators and mental health professionals as a "suicide cluster." I'm interested particularly in services to transition students who are no longer suicidal back into public school, such as interventions to relieve the pressure and help them catch up with their peers. Currently, our school board and county administration do not require interventions of any sort. Also, what can parents and PTA groups do? With the current health care that is being pushed through (cuts to medicaid - which impacts nearly EVERY program that is available for special needs people) .... how does your office intend to meet the needs of special needs individuals in the state : specifically in programs for the following: interventions, therapies, community support and independent living: when the current funding is already inadequate? Good morning! The governor is here and we'll be getting started shortly. Feel free to submit those questions now. And we're off! Talking about the environment and the Paris climate agreement. The governor defends the moves he's made to help reduce the state's carbon footprint, support alternative-energy businesses in the state. On to undocumented immigrants and the woman he pardoned. McAuliffe defending his actions. Says Trump's policies are hurting the Virginia economy; says that 60 percent of small businesses in No. Virginia are run by foreign-born owners. He believes that immigrants should not be deported unless they are convicted of serious, violent felons. He took a "simple pardon" hoping that would help. Don't have this woman "ripped" from her children over a moving violation. We have bigger issues. McAuliffe: I want to lead here in Virginia. I took the president at his word: only face deportation for violent, felonies. For simple, minor, traffic offenses, I want to do what I can do to help Virginia families. Says he'll consider taking similar action for others in the same position as Liliana Cruz Mendez of Falls Church. Have a question for the governor? Submit it now and we'll send it into the studio. On to the opioid epidemic. Can the problem be attacked regionally? McAuliffe: You have to address on a regional level - there are no borders for drug dealers. Virginia has passed legislation to help combat the epidemic. Western half of the state the problem is with prescription meds, pain killers. But in the eastern half it's heroin. Some of the steps the state has taken focus on doctor shopping and curtailing the prescriptions. McAuliffe: We need more drug courts. Putting someone in a jail cell doesn't help the individual address their addiction. They need treatment to get them off of the drugs. McAuliffe: Heroin. The drug is brought into the state. They are dumping cheap, synthetic drugs in the state, they are highly addictive. On to Medicaid: House bill won't pass the Senate. If it did it would be devastating for Virginia. Spoke about visiting a health clinic in Wise County recently - said folks were lined up to receive the care. On to the Virginia primary. Have a question? Post it now and we'll send it into the studio. What are Democrats looking for on June 13? McAuliffe: This is an off-year election. That's the challenge to get people out to the primary. McAuliffe: There is a lot of angst after November's election. I'm most encouraged by the number of candidates running for House of Delegate seats. A large number of them are women. They are challenging 17 Republican-held seats. McAuliffe: The economy - lower unemployment - is doing well. We've been a "brick wall" to protect women's health rights. He touts his efforts to restore the civil rights of felons. We're leaning in. McAuliffe: Now talking about jobs, problem filling high-paying jobs. McAuliffe laying out how the state has improved under Democratic leadership, talking about changes to high school education. McAuliffe: I"m a proud supporter of Ralph (Northam, the lieutenant governor). But he'll support Tom Perriello if he should win the Democratic primary. McAuliffe warns that major tech companies would leave, or not come, to Virginia if the state were to pass bills that would defund Planned Parenthood or North Carolina's so-called bathroom bill. Such bills would become law under a Republican governor with the current Republican-controlled General Assembly, he said. McAuliffe talking about his wife Dorothy's accomplishments as first lady - focusing on children and hunger and that he would have loved it if she had decided to run for Congress. McAuliffe: I think there will be a record turnout for the gubernatorial election in November. If Trump continues down the same path, that will energize voters, who he says will go for the Democrat, either Ralph Northam or Tom Perriello. Republicans Frank Wagner, Ed Gillespie and Core Stewart are seeking the GOP nomination. What do lawmakers need to see before they would agree to a dedicated funding source for Metro? McAuliffe: I've warned the other jurisdictions. We have to work through the (legislative) process. Reason he brought on Ray LaHood. LaHood plans to have a preliminary report by September. Full report due in November, laying out a plan to tackle during the next General Assembly session, which begins in January. McAuliffe: We can get to a formula how much Virginia needs to come up, then let us figure out how to get there. I'm more optimistic that we will get there. Va. lawmakers want to see significant changes. Do you help the system remain viable or do you make the changes before ponying up more money? McAuliffe: You do both. Let's be clear, the problems with Metro go back decades. I'd prefer no elected officials serving on the board; he'd prefer transit experts to serve on the board. Next summer - they'll come to the point with funding, the system might not be viable. We need to make a decision long before that. McAuliffe: LaHood is coming with an "action plan," not a study. I plan to act on it. McAuliffe: Let's be clear this isn't just a regional transit system. This is a global system - used by international tourists and visitors. Caller: Where has the money gone? Why haven't lawmakers held the board accountable? Why throw more money at it? McAuliffe: We're not throwing money at it. I agree with Daniel. The board needs to look at labor costs and operational costs. Virginia is not going to spend a single penny until we're assured that there is good governance. This is taxpayer money. What would Northam do if he becomes governor? Will continue in the same direction as McAuliffe: Yes. We're all in sync. McAuliffe: This system is too critical for the region. It has to survive. LaHood is asking the right questions. Collecting DNA of those arrested: Crime Commission planning to look at expanding the types of misdemeanors eligible for the collection. McAuliffe: We sent a bill to lawmakers to do that. Crime Commission will have a report to me soon. You have to balance individual rights vs protecting the community. It's also very expensive. Not easy to do to collect these samples. Two states do all felonies and misdemeanors. We're looking at those states to see if helps solve crimes or prevent crimes. I'm open to looking at it. Question from John in Leesburg: Paying $400 a month in tolls to get to work in Bethesda. Feels like he's being held hostage by the toll road. Is it ever going to stop? McAuliffe: He's recapping the express lanes project on I-66. We've got to keep these tolls down. But many of the toll deals were negotiated before he became governor. You can't make tolls so high that people can't afford to get to work. Nothing he can do for the private company that owns the Dulles Toll Road. McAuliffe: Urges John to find a job in Virginian and suggests that he ride his bike to work. I see that you have signed a bill to address the problem affecting many people - unpaid court fines which often leads to a loss of their drivers license and increasing their inability to pay the fines because they often can't find work or get to work. But I have found there are other problems. I have discovered that there is a disconnect between the courts and Virginia DMV. My son and I were forced to go back and forth between the two several times before we were told that my son’s license was no longer suspended and he could have his full driving rights restored. We then found out over six months later that he was, still indeed, on restricted license but we didn’t know that. It seems as though the Virginia DMV can be slow or negligent in updating records. If my son was stopped, he ran the risk of being arrested for driving on a suspended / restricted license even though we were told that his driving privileges had been restored. What can be done to get these records updated in a timely fashion? McAuliffe: He's tried to address this with legislation - didn't get everything he wanted. Now you can drive to a job interview. That's it for this month. Thanks to everyone who joined us and for the terrific questions. Did the Navy genuinely tell you they'd leave Hampton Roads unless you acted on Climate Change? Northrop Grumman filed a lawsuit for $10million last week. A group of us state IT employees are listening today for a message of hope from the Governor...will you keep enabling us to move forward with removing NG from our state systems and replace them with better partners for the Commonwealth? Can we please discuss the terrifying teen suicide rate in Loudoun County? What can parents do - and what can you do - to ensure students transitioning back into public school after psychiatric treatment or supported and not penalized for their absences, which is currently the case? The Virginia Dept of Education has told us they do NOT oversee or intervene in a school districts lack of support for these vulnerable children?